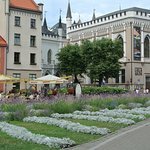 Private walking tour through Riga Old Town will take you to the most remarkable sights like St. Peter's Church, St. Jacobs Church, Dom Square and St. Dom Cathedral. 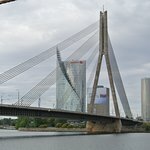 During the private Riga Old Town tour guests will see the Powder Tower, the Swedish Gate and city walls, the oldest stone residential dwellings in Riga known as Three Brothers, the Great and Small Guilds. You will hear an interesting story of Cat House and will see Town Hall Square with beautiful and elegant Blackheads House. The tour will take you to pass by Riga Castle and the building of the Parliament. Had a great private tour with Eva who told us about Riga's history and also had a good chat about life in Latvia in general. We wish her all the best! 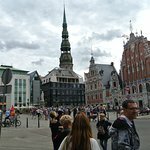 Get quick answers from Private Riga Old Town Walking Tour staff and past visitors. How do we arrange a time to begin the tour? Sorry this answer is a bit late. Tour start times are arranged with the provider via email after you sign up. They were very flexible with start times and meeting points. Hope it works out!